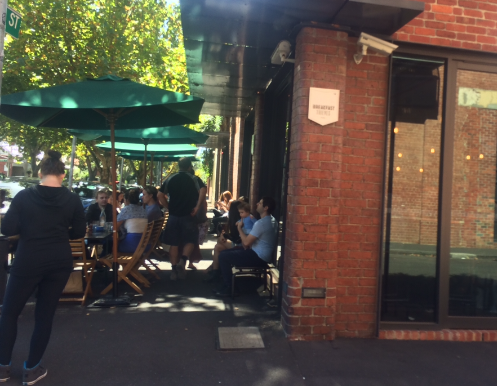 Breakfast thieves is a café located on the corner of Gore and Rose st. in Fitzroy. 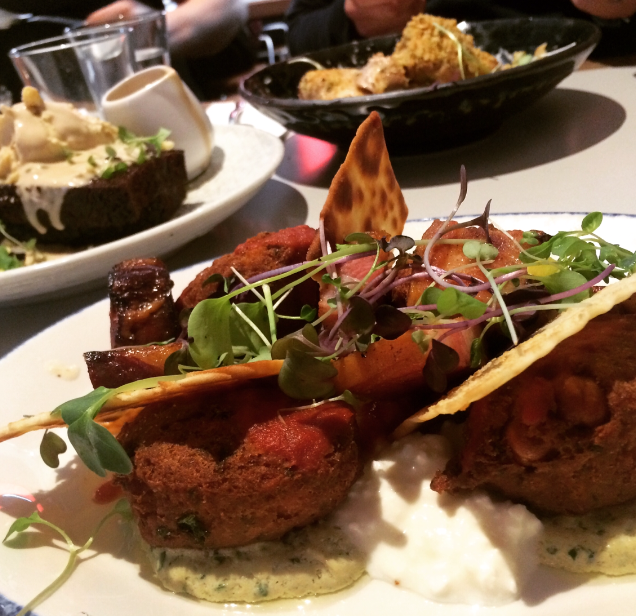 The food is creative and colourful and the menu is sure to excite and inspire. 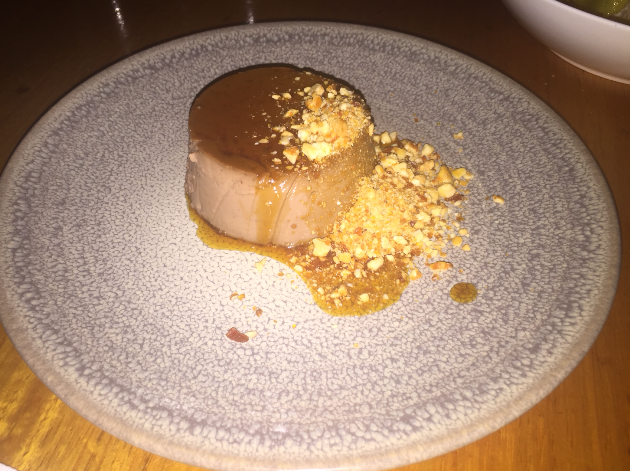 There is a contemporary vibe about the space and the food, and what I love most is that it’s a laid back casual kind of place but the quality of food and presentation is exceptional. It’s a great place for brunching adventures. It’s a really nice open space, brick walls, high ceilings, really pretty. And they have an outdoor space out front so you can soak up sun if it decides to reveal itself. 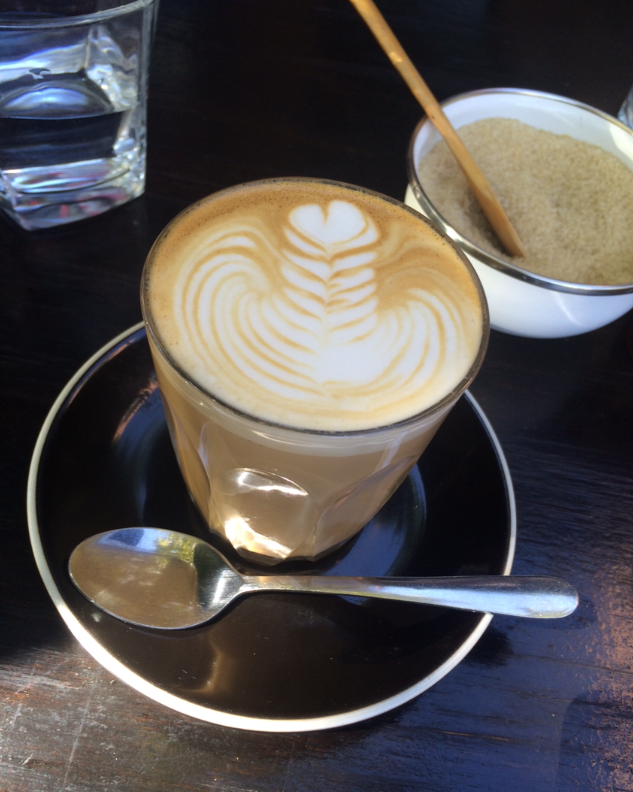 And for the coffee, it is pretty well damn straight amazing. The conquistador is a quirky looking dish and I feel looks like something out of alice in wonderland. It is a great vegetarian option. The green pea and Spanish manchengo chesse croquettes are crunchy on the outside and so creamy and oozy cheesy delicious inside. 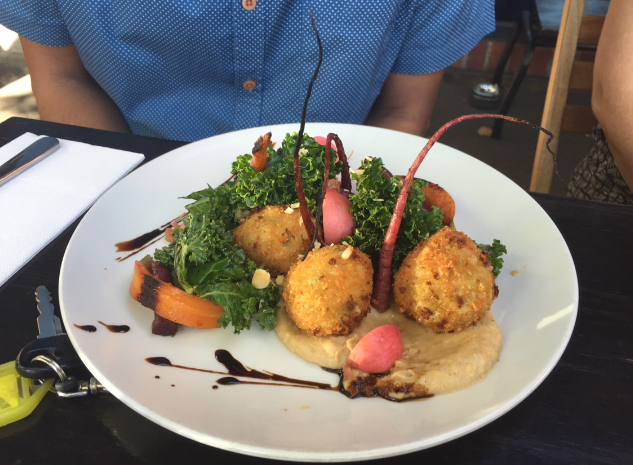 The fresh kale, flaked almonds and pickled radish and carrots were yummy. And the cauliflower and quince puree was incredible and brought all the elements together along with the balsamic reduction. 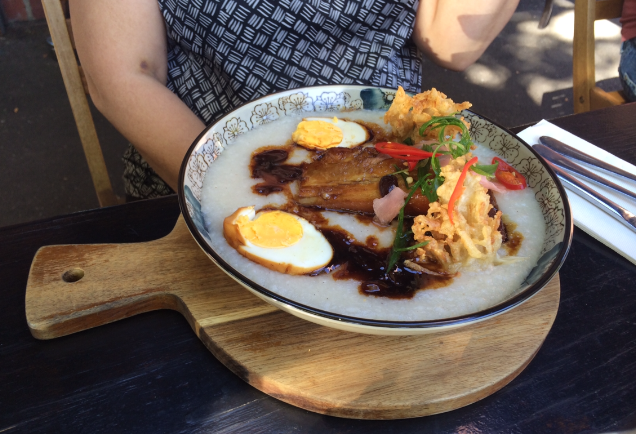 The Botak Chin Congee was gorgeous. It had Malaysian sticky honey-braised pork, soy peanuts, spring onion, pickled ginger and soy-boiled egg. The pork had a beautiful sweet soy flavour which melted apart with a gentle touch of the spoon, the congee was silky smooth, the peanuts added texture, the pickled ginger was sweet and added freshness and the egg was soft and creamy. They had these deep-fried enoki mushroom fritters placed on top, which were fun and crunchy, they were great. It was super delicious and easily the prettiest congee I’ve ever seen. 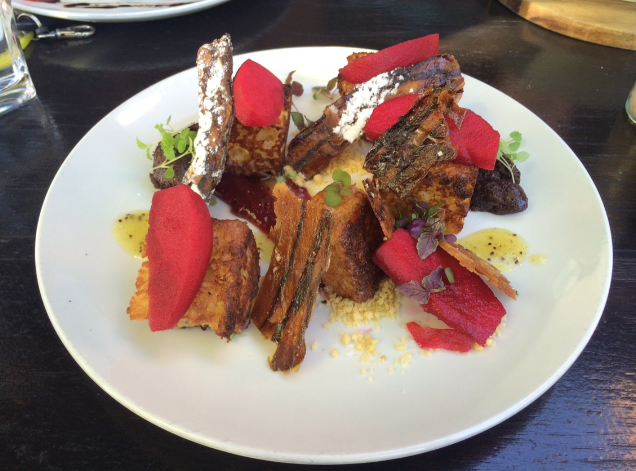 The A.B.C.D was cubes of brioche French toast, which on their own were already amazing. They had a crunchy toasty outside, buttery soft croissant like middle and were fried, which gave it donut like qualities especially when eaten with the raspberry coulis (sort of like a jam donut). Then it had slices of apple poached in hibiscus syrup, which gave it a subtle sweet floral flavour and a vibrant magenta colour. Then there was candied bacon. I was amazed at how super thin the bacon was. It reminded me of tempered chocolate but a bacon version. It was shiny and glossy, crispy and paper thin. It was fantastic it had that sweet and salty candied bacon delciousness. There was a yellow kiwi coulis and raspberry coulis, which added a little bit of a tart sweetness. The crunchy almond soil added texture and the dark chocolate mousse was densely thick and so smooth and slightly bitter, which offset all of the other sweet elements. It was like an explosion of flavours that complimented each other so perfectly. Each bite was different and each bite was magnificent. 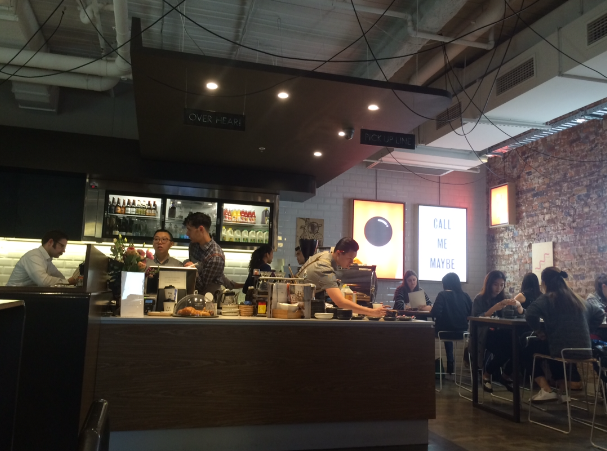 Breakfast thieves is a great place to eat high quality food in a casual and modest setting. 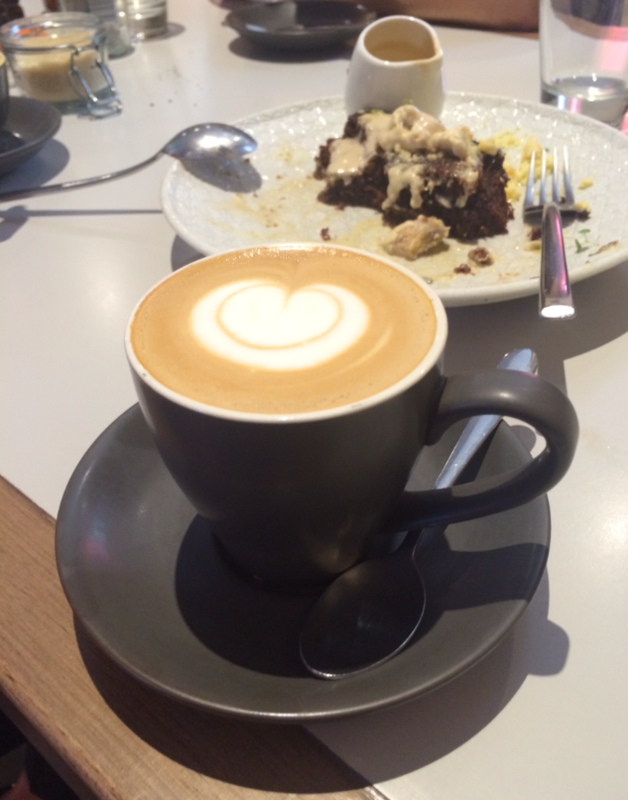 The food is impressive, the coffee is outstanding and the staff are lovely. Operator 25 is a modern brunch restaurant in the city and is the perfect place for all brunch occasions. The menu has an assortment of inspired foods from around the world, so everyone is sure to find something to suit their tastebuds. The food is incredible and on top of that, they do a mean coffee. 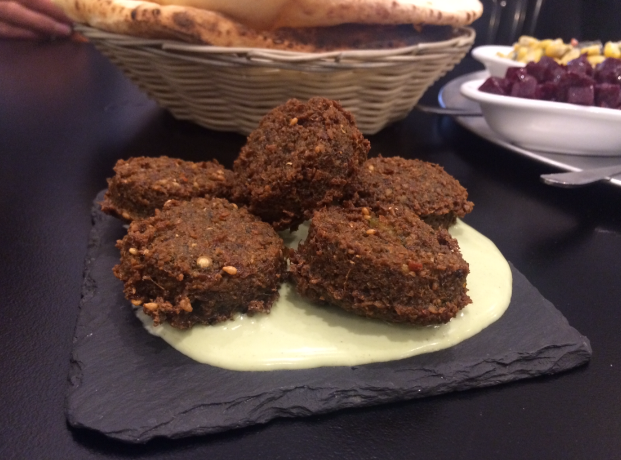 The spiced chickpea fritters are tasty and have a really nice texture. They had lots of whole chickpeas inside each fritter, which was fun. It was served with herb tahini, tomato and cucumber salsa, cottage cheese, chipotle sauce and crisp flatbread, which made every bite different and exciting. We had the addition of thick cut streaky bacon, which was super thick and delicious. Bacon lovers ahoy. 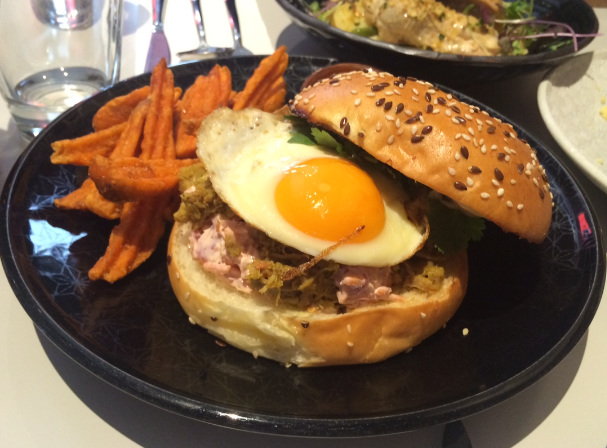 The Balinese pulled pork burger is delish! It has a combination of Balinese curry pulled pork and a creamy chilli mayo pulled pork with a cabbage and carrot slaw, fresh coriander and a fried egg. All in amongst a toasted buttery bun. It had loads of really rich indulgent flavours. Ahmazing!! And also the sweet potato fries were really yummy too. 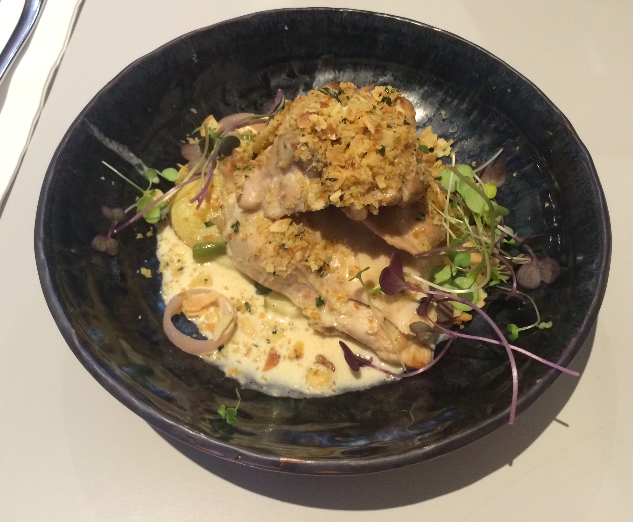 The chicken a la normande was nice. The chicken was moist with a thin creamy sauce. It had braised apples, pickled shallots, kipfler potatoes, green beans and an almond crunch. Lots of subtle flavours and good textures too. We shared a serving of the ginger & date bread w banana mascarpone, pomegranate sauce & salted milk crumb. OMG it was freakin’ delicious! 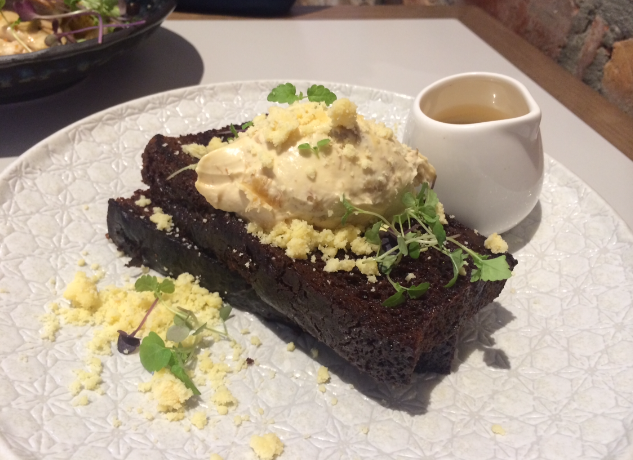 It was like the texture of a moist banana bread but sticky like a sticky date pudding. The warm tones of ginger and the sticky sweetness were so yum. There were also little pieces of candied ginger that give you extra pops of that sweet ginger. Then on top there were caramalised banana slices and banana mascarpone which had fresh banana through it. This was absolutely a stand out dish. It’s a perfect meal to eat in the cold weather because it has a warming and comforting effect. So delicious! Action shot, pouring the sweet sweet sauce. The banana mascarpone lightened the dish with the fresh banana flavour and the milk crumb added texture. All the flavours went wonderfully together. They make a really yummy coffee, which btw went absolutely perfectly with the ginger and date bread. Ok so I’m obviously a little obsessed with this ginger and date bread but it was just so delicious. There is a good variety on the menu and lots of amazing dishes to try. I already want to go back to try the elderflower sago w chia seeds, rhubarb and strawberry compote, white chocolate foam and freeze dried mango. It looked so delicate and delicious. All of the food was amazing and presented beautifully. 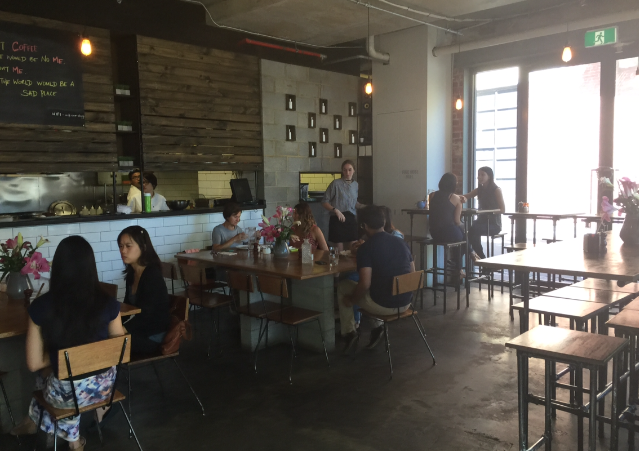 It’s the perfect place for brunching adventures and also a good stop for some great coffee. 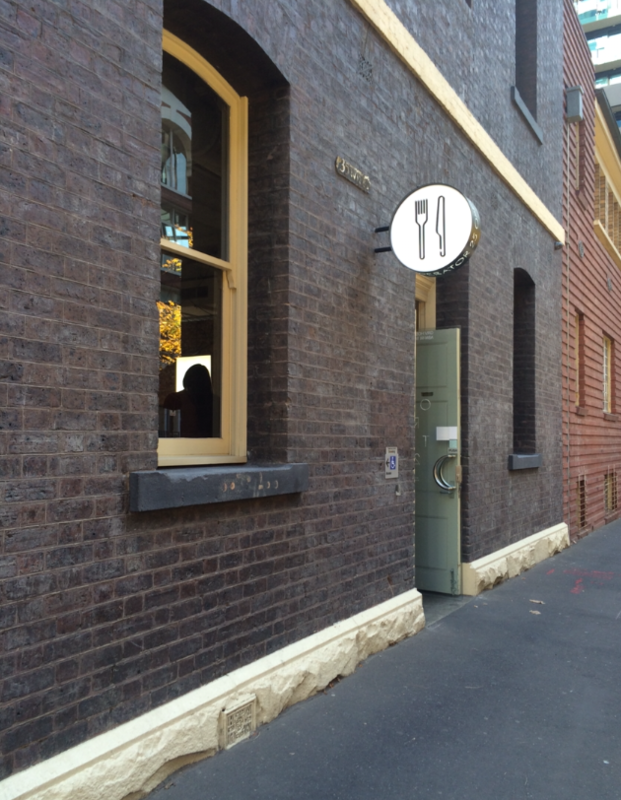 On the top end of Collins street, this restaurant is hidden upstairs with only a door and a sign to indicate it’s existence. 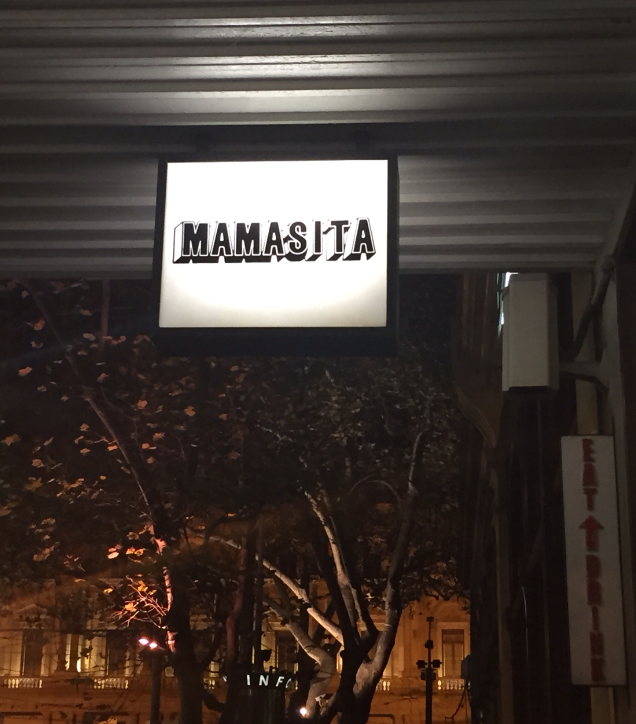 Mamasita has been around for a long time but still has people queuing out the door for dinner. The food is delicious and served pretty quickly. Plus they have a range of specialty tequilas. For lunch it is a bright sunlit space and for dinner it is a dimly lit space with more of a bar like atmosphere. Mexican food at it’s finest. Street-style corn is always a crowd pleaser. 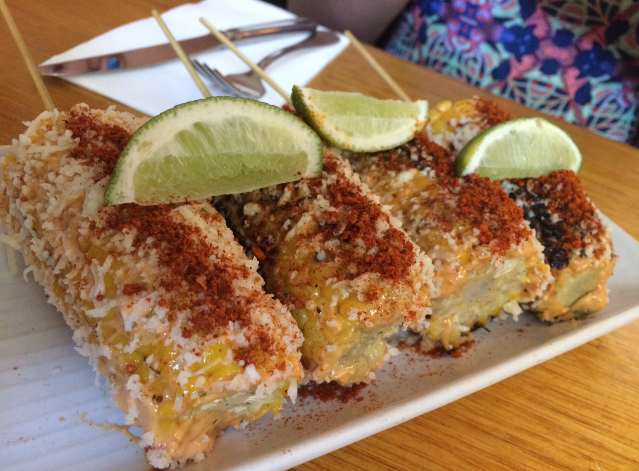 This chargrilled corn on the cob is covered in delciousness like chipotle mayo, grated queso cheese, paprika and lime. Cheesy, creamy, spicy and zesty all in one. Yum! 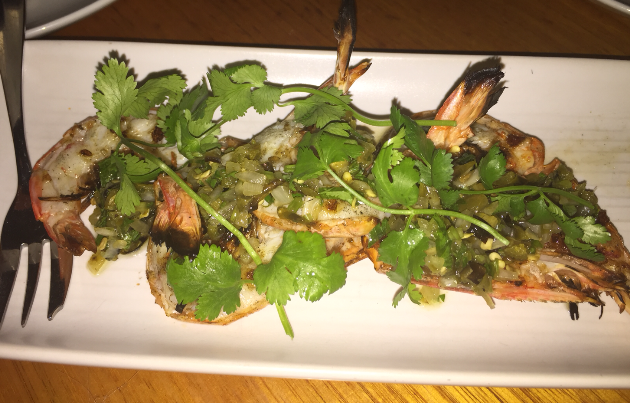 The butterflied soft-shell tiger prawns were amazing! The prawns were cooked perfectly and the chargrill brought out the sweetness in the prawn. They were full of flavour and the Serrano salsa had quite the kick. The salsa was fresh and quite hot (delicious hot) and was topped with fresh coriander. Loved these so much, had to order more. The tostaditas are a good starter to share especially if you’re out having a drink with a bunch of friends. They are crunchy round corn tortilla chips (like crispy taco crunch) with different toppings. 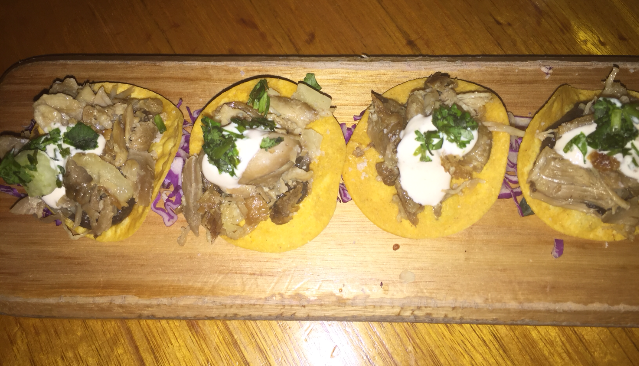 We had the duck carnitas (shredded duck) & pineapple with black-bean puree & habanero cream sitting on a bed of red cabbage. 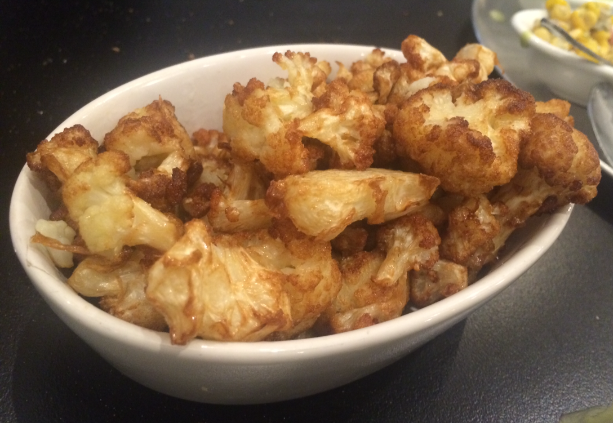 They are easy to eat and absolutely delish. The Guaijllo braised pork belly was so soft it melts in your mouth. 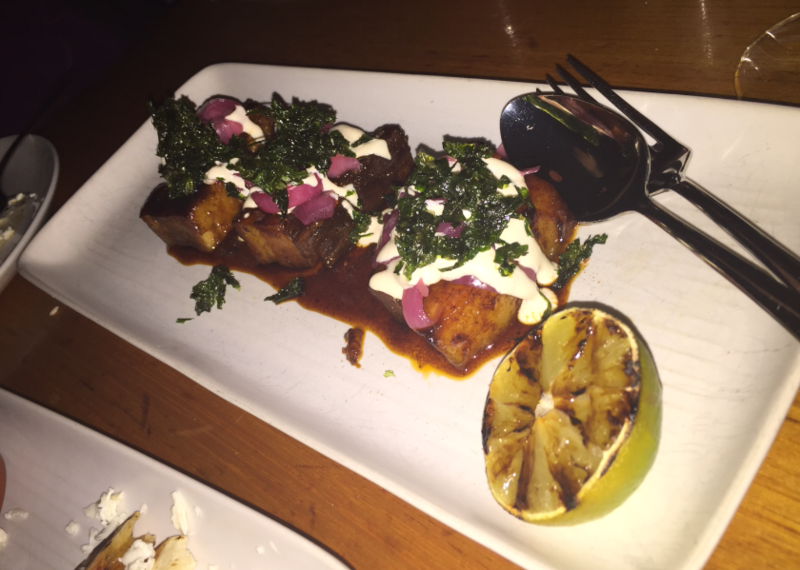 It was covered in a delicious spicy moreish sauce and topped with creamy habanero cream and fried parsley. It was incredible and full of flavour. The chargrilled lime helped balance the rich flavours. Super tasty. 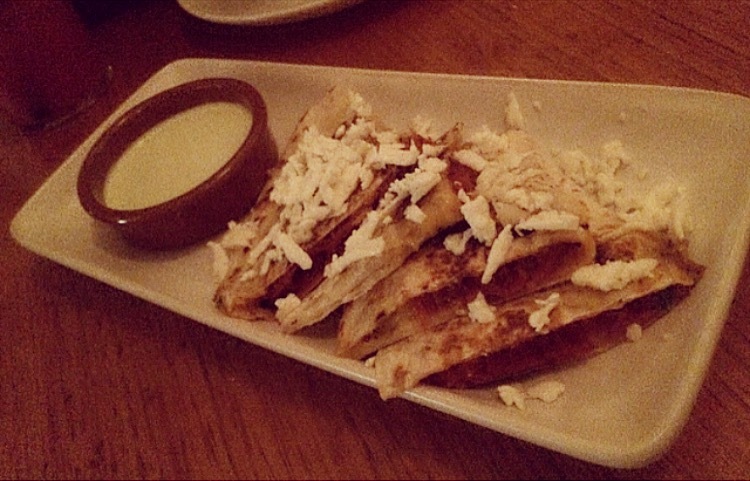 We tried the wheat tortilla filled with chorizo, potato & mexican cheese, queso fresco & jalapeño crema. It was nice. The jalepeno cream was not very hot so we ordered a side of spicy salsa for dipping. 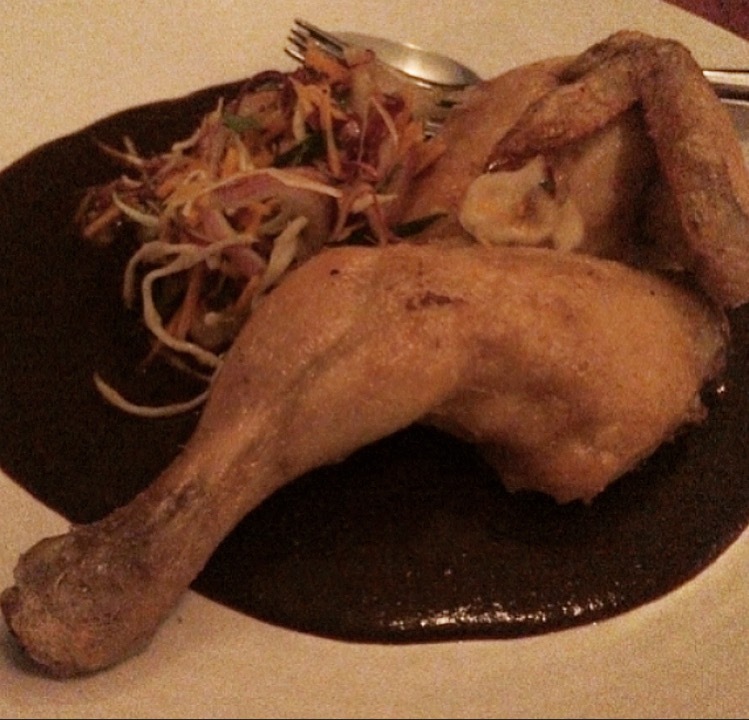 The crispy skin half chicken w red mole was interesting. The sauce was thick and you can taste the chocolate and chilli flavours. It had a nice smooth texture to eat with the tender chicken. The three milk sponge cake was a soft wet (soaked in milk) sponge cake, really creamy, moist and delicious. 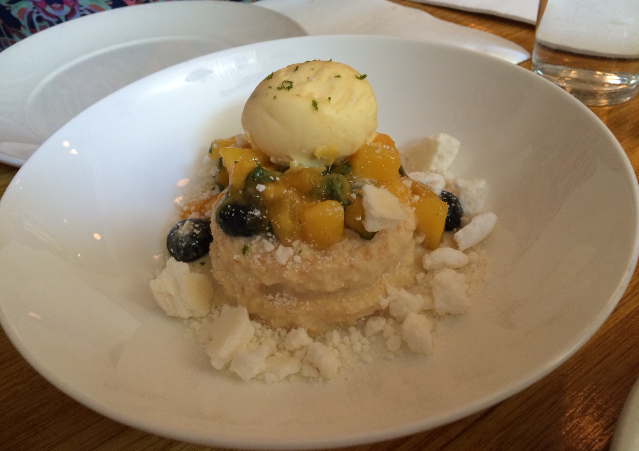 There was a scoop of passionfruit sorbet, sweet pieces of mango, tart blueberries and meringue, which added some texture. All these different elements complimented the cake and made this dish exciting. The chocolate and orange flan had a thick and smooth consistency. It was creamy and indulgent. It had a nice almond praline for some crunch. 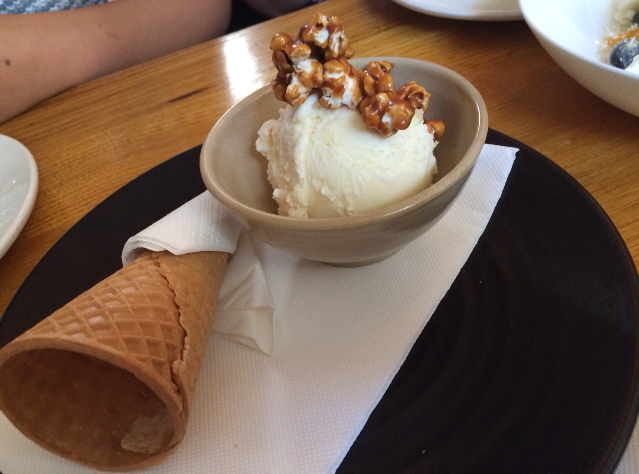 The sweet corn ice-cream w salted caramel popcorn is a popular dessert. It has a subtle sweet corn flavour and is a good finish to the meal after eating lots of intense flavours. 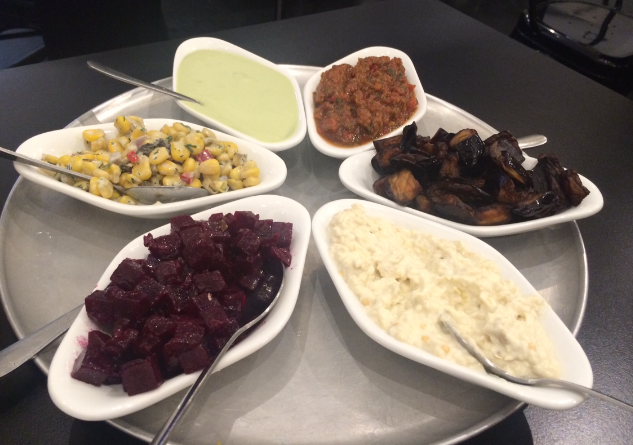 Mamasita serves up remarkable Mexican food in a modern way. 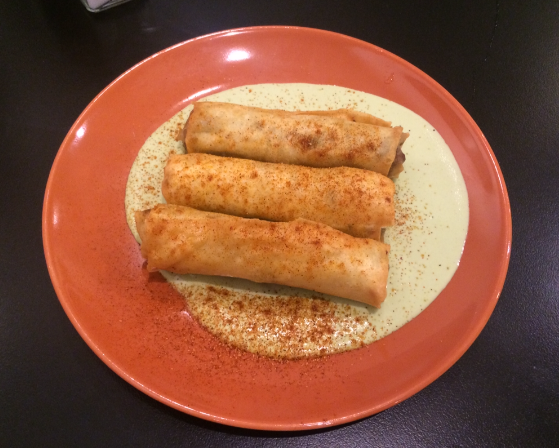 They use a variety of traditional Mexican chillies and ingredients to create quality dishes. And btw most of the menu is gluten free, so winning for the GF peeps. 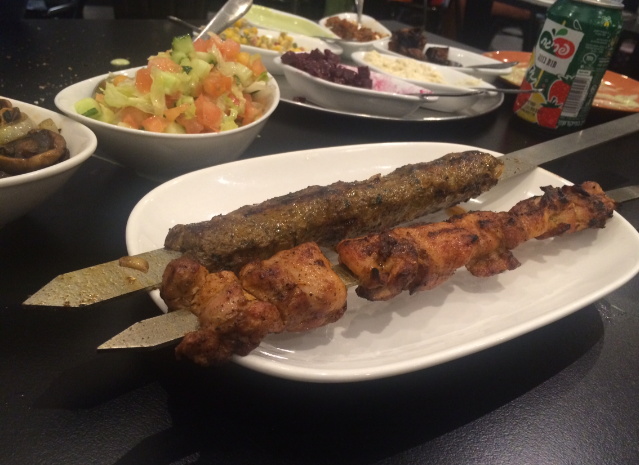 The food is delicious and served quickly and the staff are lovely. This place is always busy for dinner so you might have to wait a little to be seated. If patience isn’t your thing, you could maybe try a weekday lunch for a lesser waiting time. 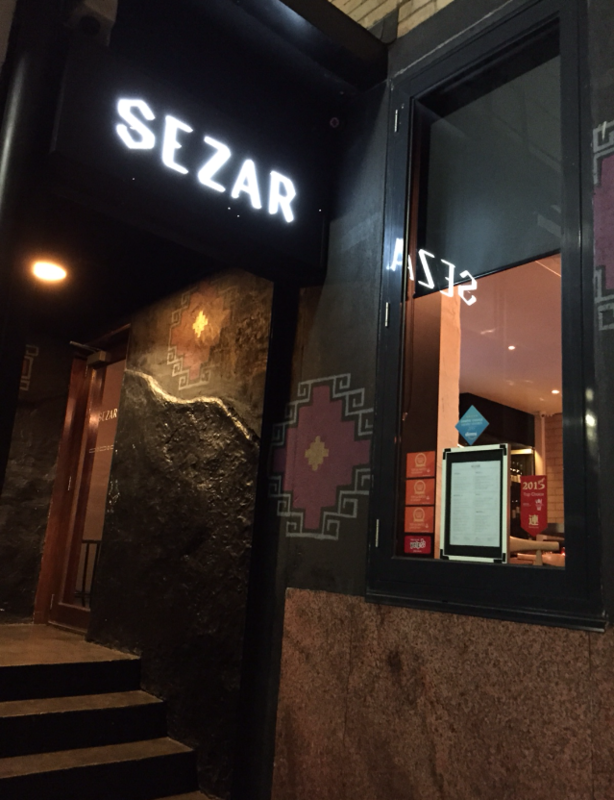 Sezar is a modern-style Armenian restaurant hidden down a Melbourne lane-way. 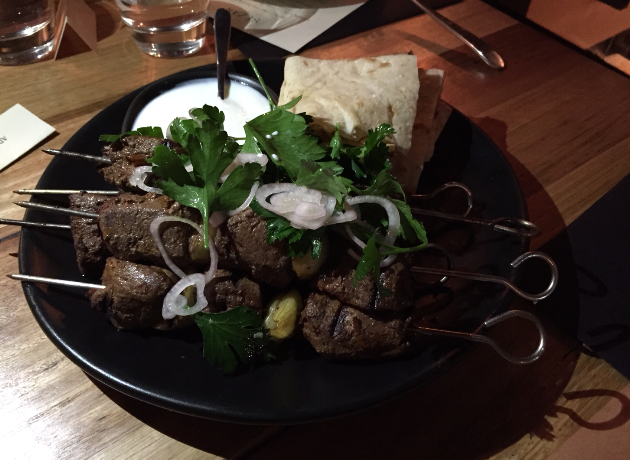 They take the traditional flavours and techniques of Armenian cuisine and create delicious contemporary dishes that are great for sharing. We had these delicious cocktails that went down a treat. 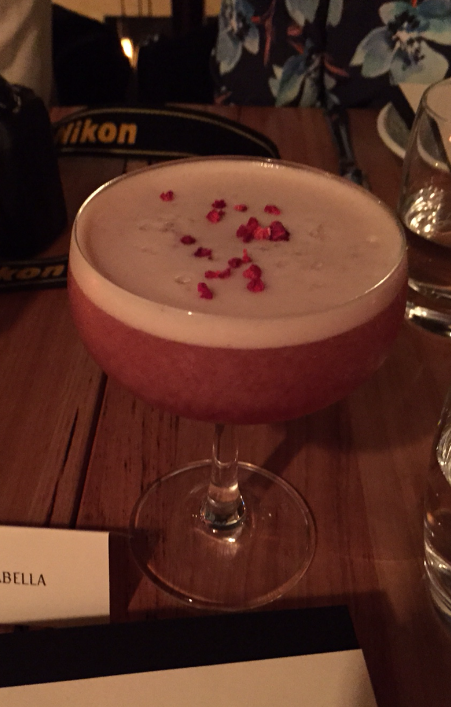 The sezar express, they had gin, raspberry puree, fresh lime and freeze-dried berries sprinkled on top. Deelicious! 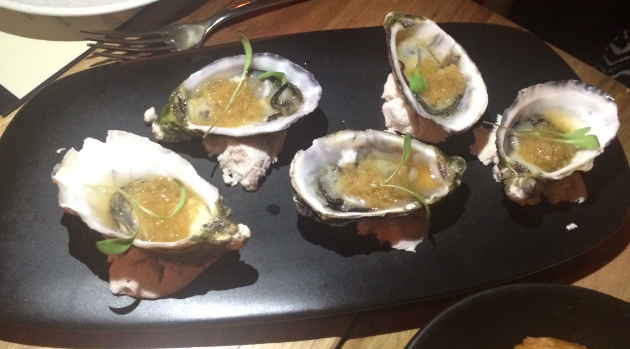 The oysters were a perfect starter, the compressed apple and anise liven your palette but in a subtle way so the fresh oyster taste is not lost. The bastourma (air dried beef) & egg was so yum I could have eaten a whole plate to myself. They were mini rounds of toasted buttery brioche w garlic jam. 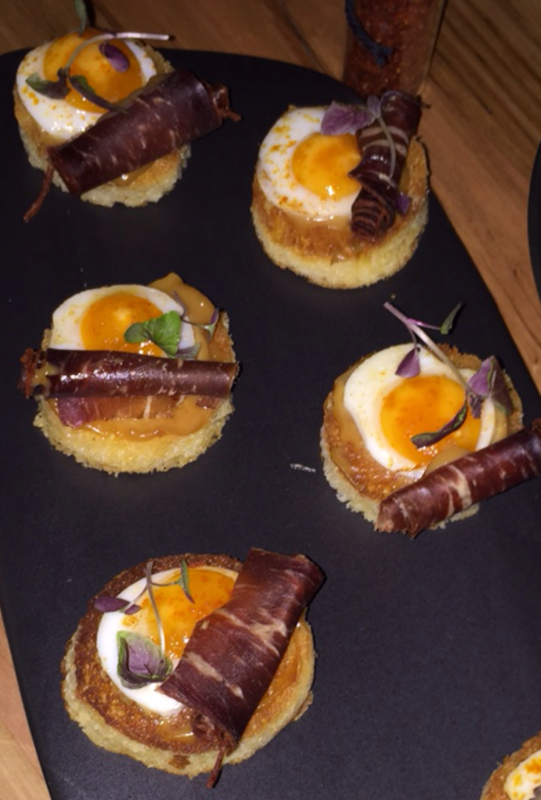 Then there was a fried quail egg (sunny side up) and a rolled piece of air-dried beef (mmm salty). 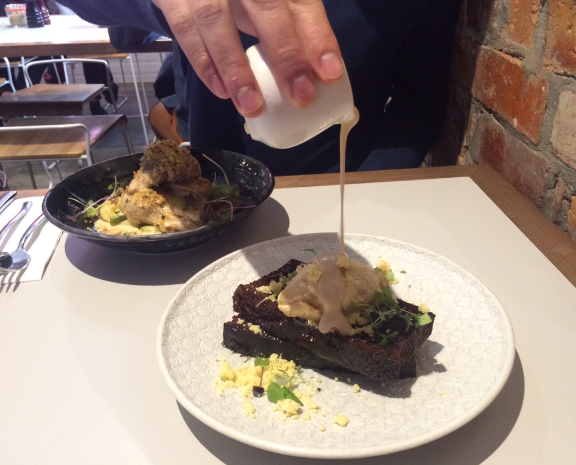 The oozing yolk was creamy and rich and decadent. The spinach & feta boreg are a good veg option. 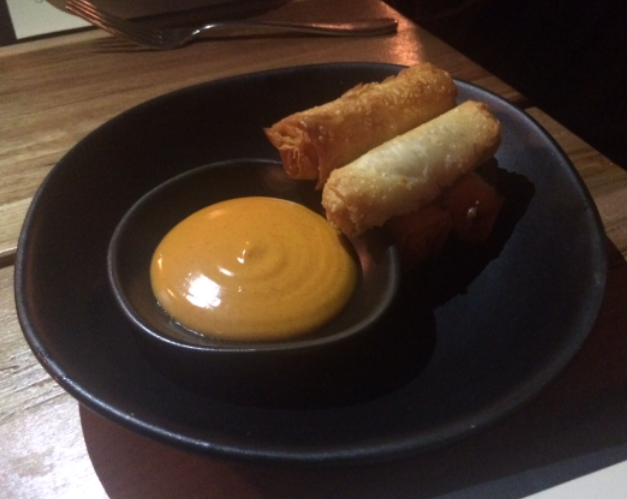 They were like little spring rolls filled with spinach and feta, served with Aleppo mayo (spicy capsicum mayo). 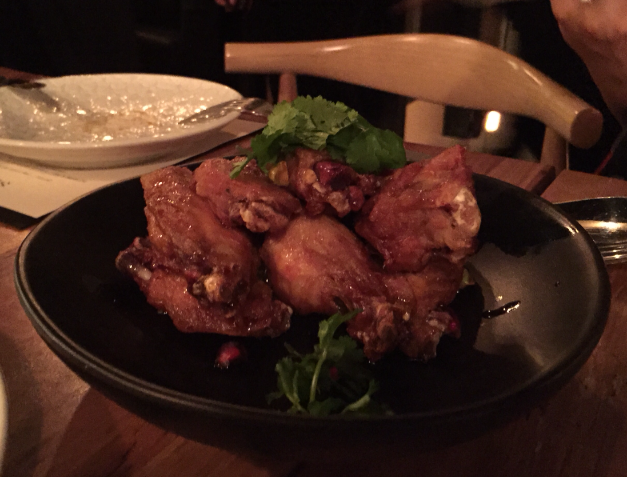 The twice-cooked chicken wings were a hit. 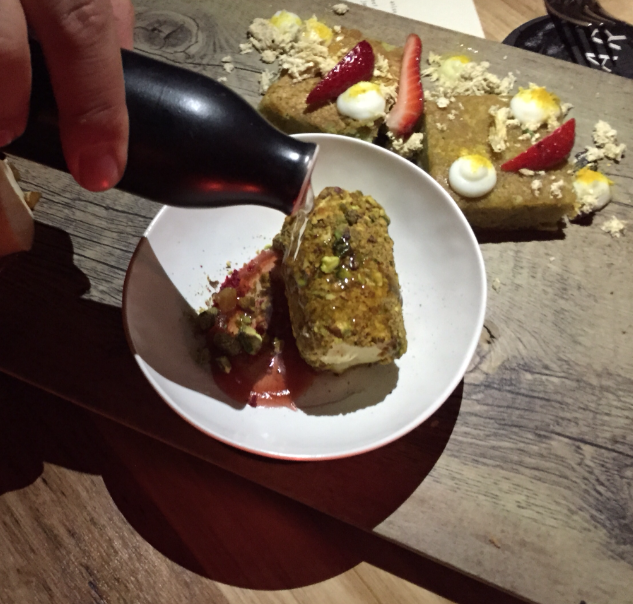 They had a sweet sticky pomegranate glaze with some scattered pomegranate seeds about the plate with crushed pistachios and fresh coriander sprinkled on top. Chicken wings are always a crowd pleaser. 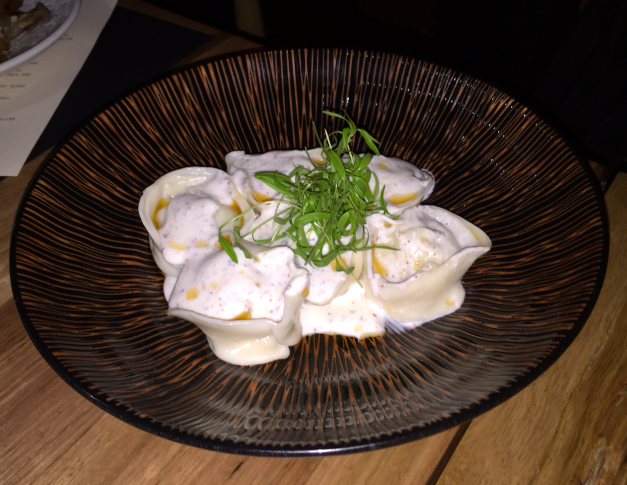 The spanner crab manti were these Armenian dumplings covered with a creamy sumac yoghurt & chilli oil. They were very creamy and the crab flavour was prominent. 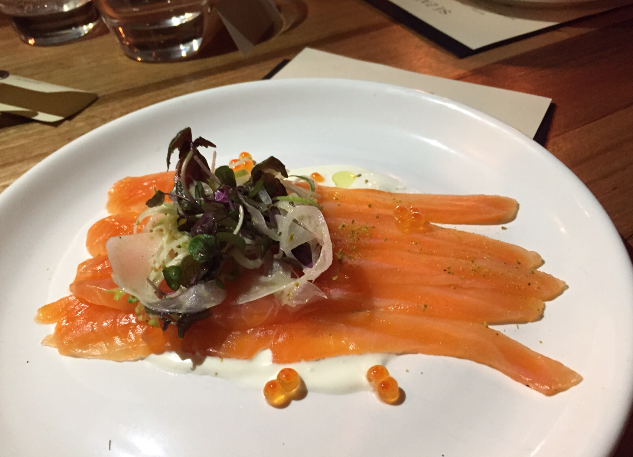 The cured ocean trout was divine, it was thinly sliced and melted in your mouth. The apple & fennel salad complemented the oily trout and the crème fraiche & roe added richness to the meal. This dish was really lovely. 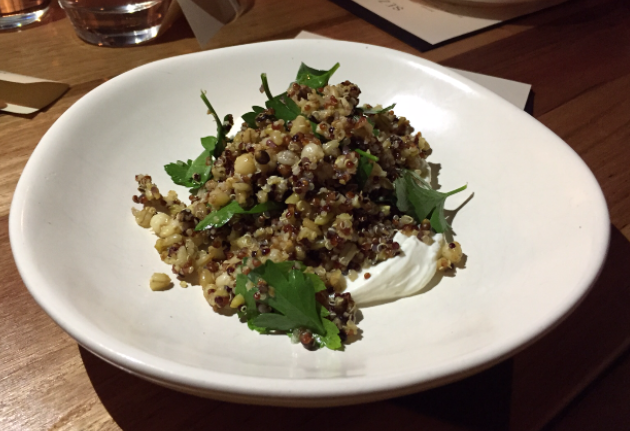 The grain salad had a combination of grains with toasted pumpkin seeds, almonds, and sour cherries. It had a creamy labne to bring it all together. The kataifi wrapped braised lamb was delicious. 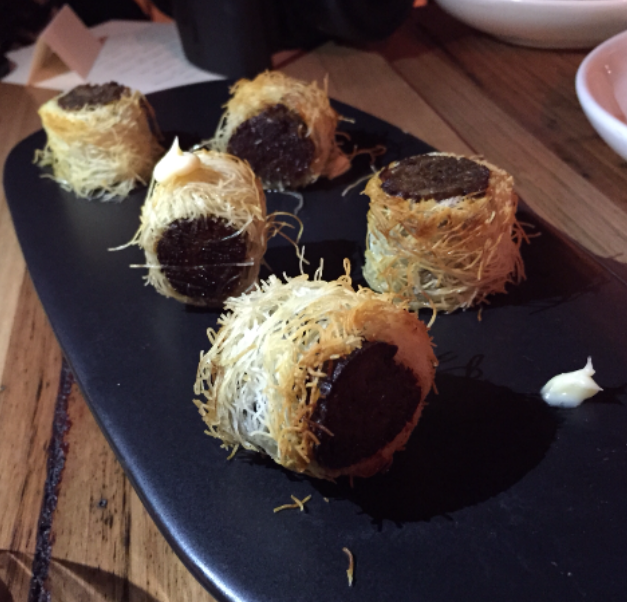 The fried kataifi had crispy wispy bits that were awesome with the soft braised lamb neck centre. The spots of sesame mayo went perfectly with this dish. Yumness! The BBQ wagyu beef tenderloin was rare and pink in the middle. 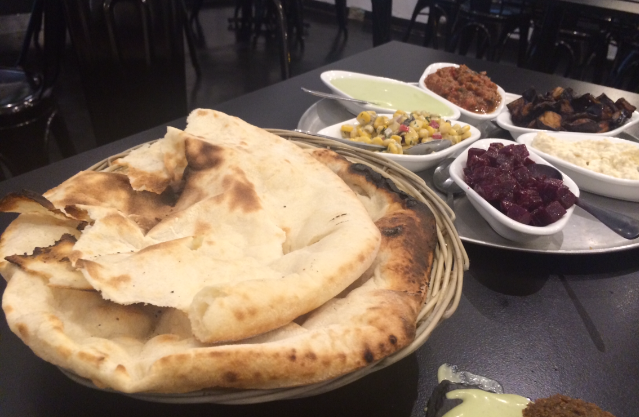 It was marinated in aromatic spices and was so so tender. It went so well with the garlic yoghurt & lavash a soft Armenian flatbread. 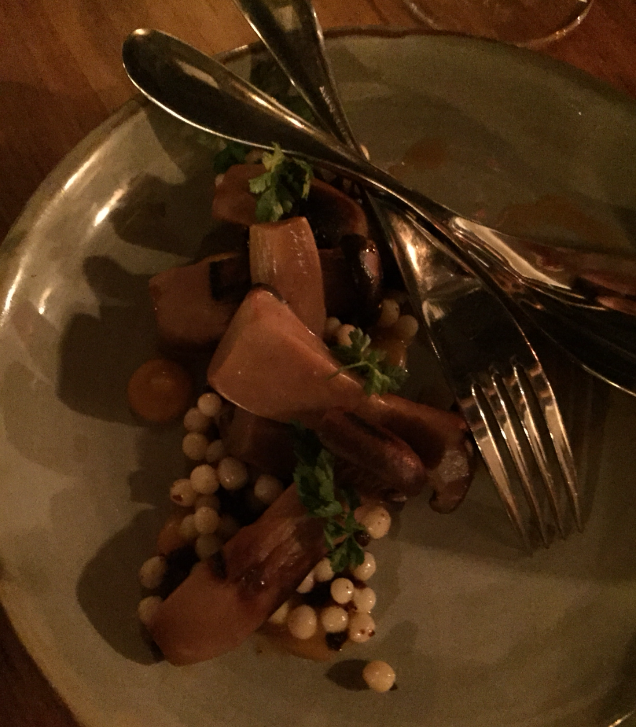 The BBQ king browns mushrooms were really tasty and they were paired with toasted Israeli cous cous, sujuk & sweet potato puree. It had a nice earthy flavour. 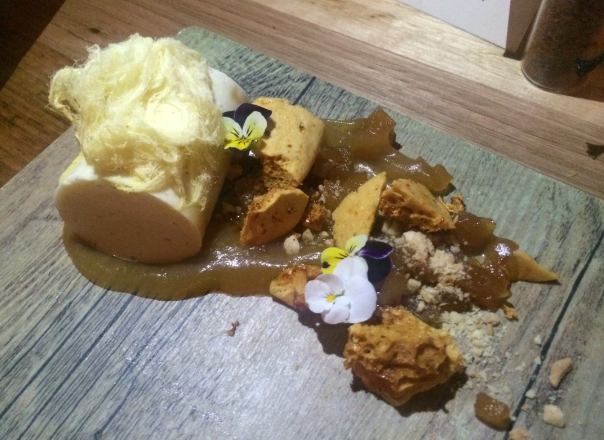 The almond milk panna cotta was a beautiful texture and was a nice subtle flavour to go with the slow cooked pear and honeycomb. It was topped with toasted almonds & persian fairy floss. Very pretty. 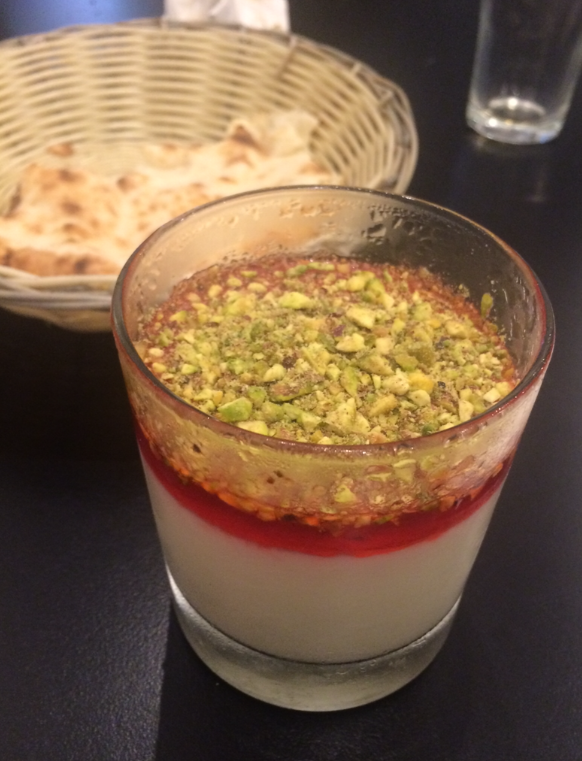 The vanilla parfait was rolled in nuts and drizzled with sweet rosewater syrup. It was nice. Then there were pistachio cakes, which were really moist (like a syrup cake) and had a strong pistachio flavour. 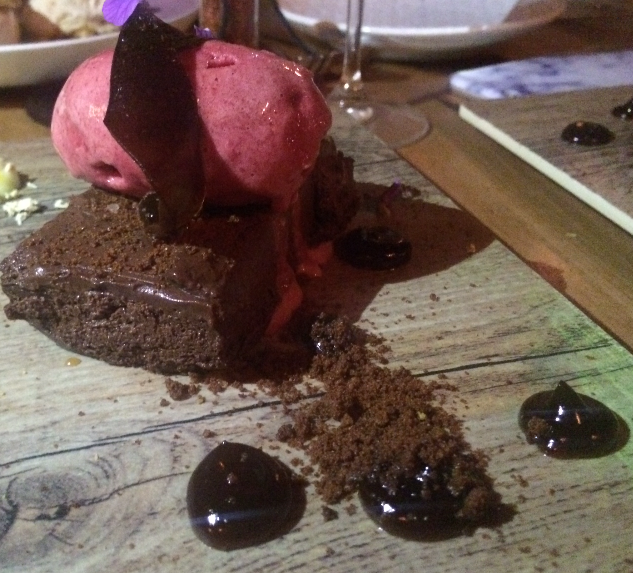 The chocolate Marquis was like a rich and dense chocolate mousse with chocolate crumb. The sour cherry sorbet had a really subtle cherry flavour. The new style baklava was an ice-cream sandwich twist on the traditional middle-eastern sweet baklava. It was my fave dessert. 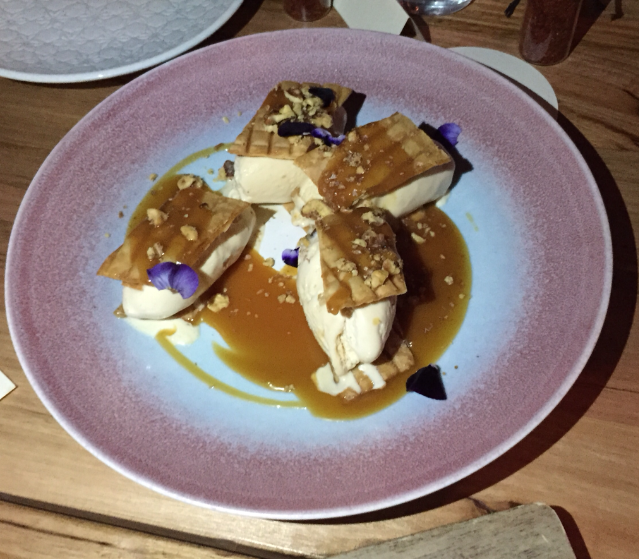 Quenelles of walnut toffee ice-cream between two layers of filo pastry drizzled with a salted caramel sauce with crushed nuts on top. 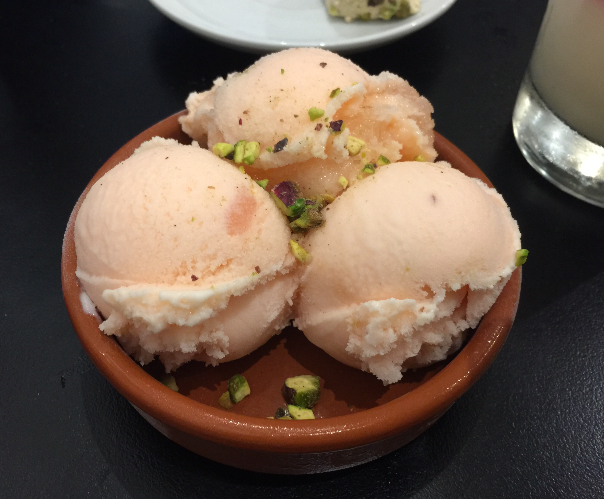 It had all the flavours of baklava but in different form, very clever. Sezar restaurant creates contemporary style dishes but has maintained the flavours and the essence of traditional Armenian cuisine. A great place to down some tasty cocktails and share some fabulous food. Fri:12.30-3pm (lunch), 5.30pm-11.30 (dinner), Sat: 5.30-11.30pm, Closed Sunday. 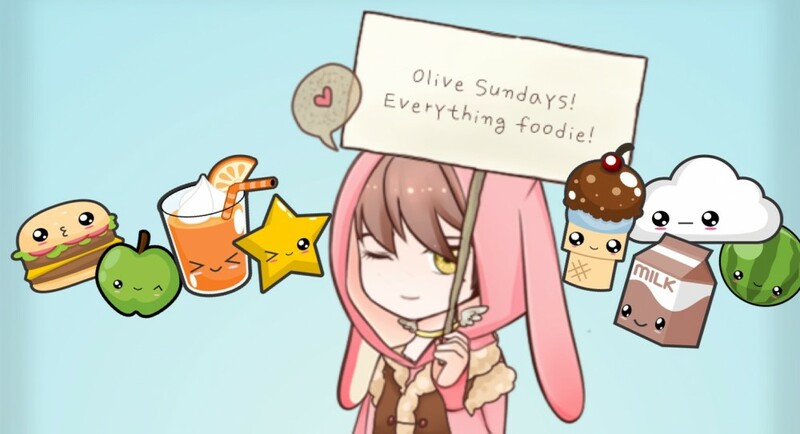 Note: Olive Sundays was invited as a guest to Sezar restaurant.